Hi everyone! 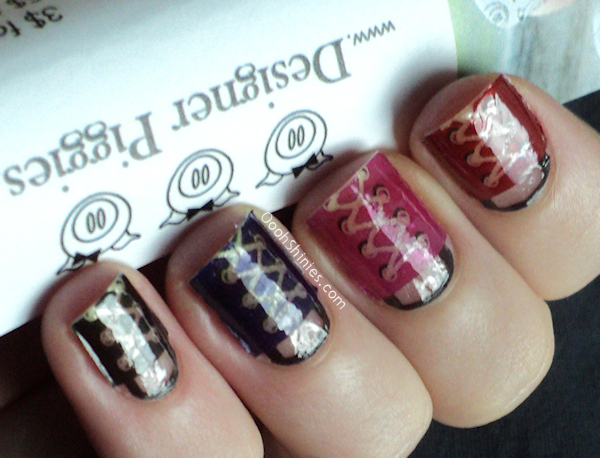 I recently received some Designer Piggies nail decals for review, but when I had time for it I had bad light (yeah, I should really get lightboxlamps again!). But this morning we had some sun and I decided to go for it, but of course it started to rain when I wanted to make pics. Just my luck! :P So I appologize in advance for the bad quality of the photos. Anyway, these Designer Piggies are the creation of Cindy and I love it when people get creative and make their own nail stuff! I think her designs are pretty unique and you can find them all in her Etsy store. 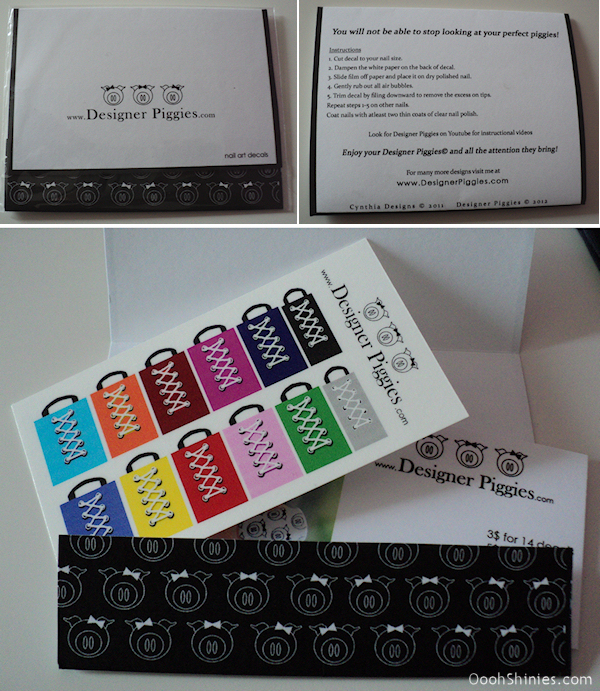 The decals arrive in a nice package with clear instructions on the back. 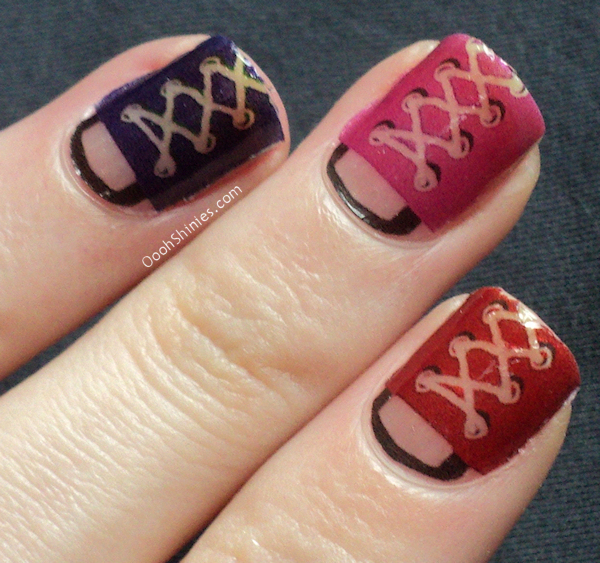 It's a matter of cutting the decals, dampen the white background, slide the decal off and place it on your nails. The instructions said polished nails, but I thought, you won't be able to see the polish anyway so I'll just go for basecoat instead. But it turns out these things are partially clear, so you can personalize them with your color of choice as background. The application itself was pretty easy, the decals aren't as thin and squishy as the average water decals nor are they as hard as nail stickers. But I did have some issues with them that I also have with most of these products, cutting the sides at the right width. Of course big photos show that even more, it wasn't as visible in real life but there's definitely room for improvement in my cutting. Another issue that I have with these kind of things is that you have to file the excess decal off your tips. I always end up filing away some of my nails as well! After the application you have to seal these Piggies in with top coat, but I got some top coat on my fingers and ended up doing a cleanup, which seems to have loosened the sides a bit. What I did notice when I applied top coat, is that there's a subtle shimmer in these decals! Anyway, here's the result. As you can see the result isn't exactly smooth :/ I know it's most likely my application though, here's an image from Cindy's site that shows the same decals on a white base polish. Quite a difference, huh. 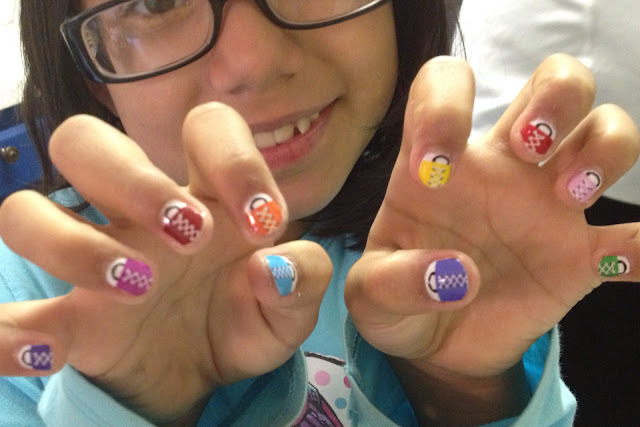 What do you think of her designs, and do you also have a hard time with the application of products like these?